Gary Dunn has been working for the Marion County Board of DD since 1993. Before that time, Gary attended Marca School and transitioned to Marca Industries. Gary was hired by MCBDD as a groundskeeper and was then promoted to maintenance assistant and is doing a great job for us. Gary is a lifelong Marion resident and enjoys his job. His favorite part of his job is still keeping the grounds as he enjoys mowing and any kind of yard work. He also is always willing to learn new things and enjoys any special projects that come up for our maintenance staff. 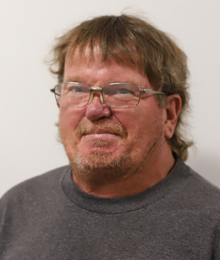 Gary feels fortunate that the County Board of DD helped him to get where he is today and has the same wish for those who are served. He wants them to have the opportunities to use their strengths, learn new skills and achieve their goals.